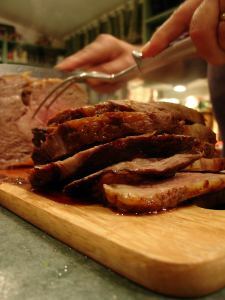 Here’s a great recipe if you’re trying to learn how to cook a prime rib roast. Try it! Make small slits over the prime rib and fill each slit with a slice from the clove of garlic. Season liberally with salt and pepper, and place on a rack set inside a deep roasting pan. Roast for 2 hours until medium-rare, or 135 degrees on a meat thermometer inserted into the center. Turn the meat onto a platter; tent with foil to keep warm. Place the pan with the roast on top of the stove burner. This is to “deglaze the pan” to make the au jus. Add the wine to the pan drippings and cook over high heat, scraping the bottom of the pan. Add the stock and cook until reduced by half. Mix in the thyme and season with salt and pepper, to taste.